Thankful Thursday: twinkly needs your help! Today is the day I look for the positive, the good, the happy, the joy, the love, the beauty. But I am ready to throw in the towel after only 2 Thankful Thursdays because of the name “Thankful Thursday.” I like the alliteration. I like having a designated day where I keep my post positive. I like thinking of things for which I am grateful and which make my heart light. 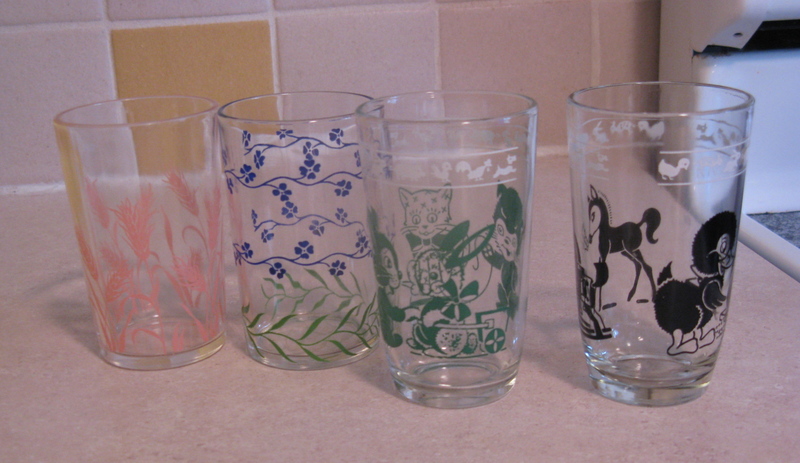 my collection of Swanky Swig glasses, or really all of my little vintage juice glasses. Do you know these? In their day, they were sold as containers for jam or jelly and then you’d get to keep the glass after you used the product. Such wisdom, such a great selling tool, such American ingenuity. Highly collectible, inexpensive, and easy to find. A balm. Now that you’ve reached the end of this week’s Thankful Thursday, please consider leaving me your suggestion for a new name for these posts of levity and gratitude. I know it’s scary to leave a comment–you have to register your name and email (well, at least I think you do). Then it gets easier and you can comment quickly and easily any time. Yup. I’m waiting. Here. All. Alone. For a name.